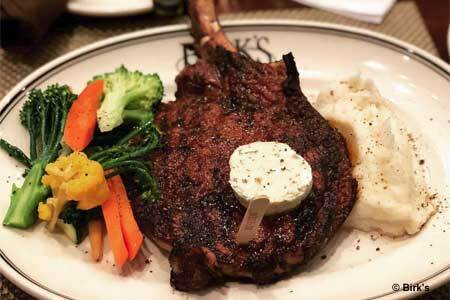 : Birk's classic American menu centers on steaks, chops and seafood. Lunchtime draws corporate crowds, and in the early evening the bar rocks with techies seeking other techies. To aid their search and to warm them up, Birk's has myriad single-malt Scotches and tasty microbrews. Start with a unique rendition of fried calamari topped with pecorino cheese, herbs and lots of garlic. For entrées, opt for the wood-smoked prime rib or Birk's pork chops served with satay-style peanut sauce. Other enticing entrées include the pasta paella, the blue-cheese-stuffed filet mignon and the organic chicken breast, pan-roasted with hearts of palm.